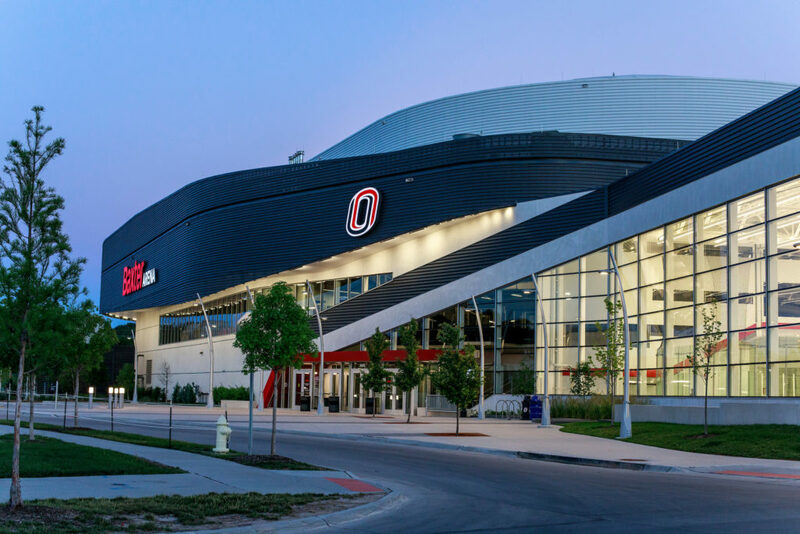 Baxter Arena has hosted UNO athletics since the fall of 2015, as well as various concerts and community events. Photo courtesy of UNO Communications. On Wednesday, Baxter Arena announced that the facility would be adapting a clear bag policy for all athletic and ticketed events, effective immediately. The move was announced on their Twitter page early Wednesday afternoon. Contact was made with all season ticket holders to announce the new policy. Baxter Arena will be providing “…one bag for every four season tickets,” according to the notice. Baxter Arena’s Twitter account clarified later that this meant one bag for every 1-4 season tickets, two bags for every 5-8 season tickets, and so forth. Baxter Arena opened with the University of Nebraska at Omaha’s (UNO) first home hockey game of the 2015/16 season against Air Force. According to Dave Ahlers, the university assistant athletic director of communications, the goal with this move was simply to keep up. “It was more to get us in line with some of the other local venues… it’s becoming an industry standard,” Ahlers said. Currently, Memorial Stadium (Lincoln), TD Ameritrade Park (Omaha) and the CenturyLink Center (Omaha) adhere to similar, if not identical, standards. The policy (found on Omavs.com) states that all bags must be “no larger than 12 inches tall by 12 inches long by 6 inches wide.” They must be a “transparent plastic, vinyl or PVC tote.” Small clutch-sized purses or wallets are allowed, providing they not extend 4.5 inches in height, and 6.5 inches in length. “We’ve been working on the policy for the last six months or so… how we were going to get the information out… and then just developing the message and the signage that accompanies the policy,” Ahlers said. Arena and university staff made the decision together, according to Ahlers. No other groups were consulted – however, that is not uncommon. “I think the decision was handled pretty well,” added MavRadio Sports Director Owen Godberson, a junior at UNO. The Red Army itself was unavailable for comment by publication. Baxter Arena has been the home of UNO basketball, volleyball and hockey since the fall of 2015. The arena also hosted the USA Olympic Curling Trials in the fall of 2017. Baxter’s first event of the UNO athletic season is a black/white scrimmage on Friday for UNO volleyball.